If you read the blog on Friday you will hopefully remember that I had my physics consultant debut. 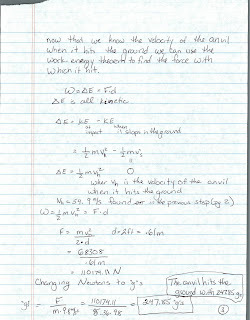 I got to be the physics consultant for the Science Channel's Flying Anvils special. No, I wasn't actually on TV, no I didn't get to shoot an anvil and no I did not meet Tory. But my name was in the credits and hey, that's a start. Ok, so it was very tiny in the credits but darn it, it was there. So hopefully you watched the show, but if you did not, I will sum up the physics and like any good physics student, show my work. As we all learned during the show, anvil shooting has been a sport for roughly 200 years. Rowdy blacksmiths used to shoot anvils to amuse crowds and scare of invading armies. Much like the Scottish Caber Toss it developed from a fun and useful activity into a serious sport. Flying Anvils filmed the national championship of anvil shooting, following several teams including two teams from the same family of anvil shooting legends, the Bollingers (spoiler alert). You first question is probably "how exactly does one shoot an anvil?" That was certainly my first question. You need three main components, a "base anvil" a pound of black powder and a 100lb shootin' anvil. The two anvils are placed base to base with black powder packed in between. A fuse is lit, the contestants walk away more slowly than I would, the powder explodes and the anvil shoots an average of 180 ft in the air. Teams receive points for the height of the anvil and ose points for every inch the flying anvil lands from the base anvil. So why did this show need a science advisor? There are already so many physicists involved in this sport I was surprised they wanted to add another. 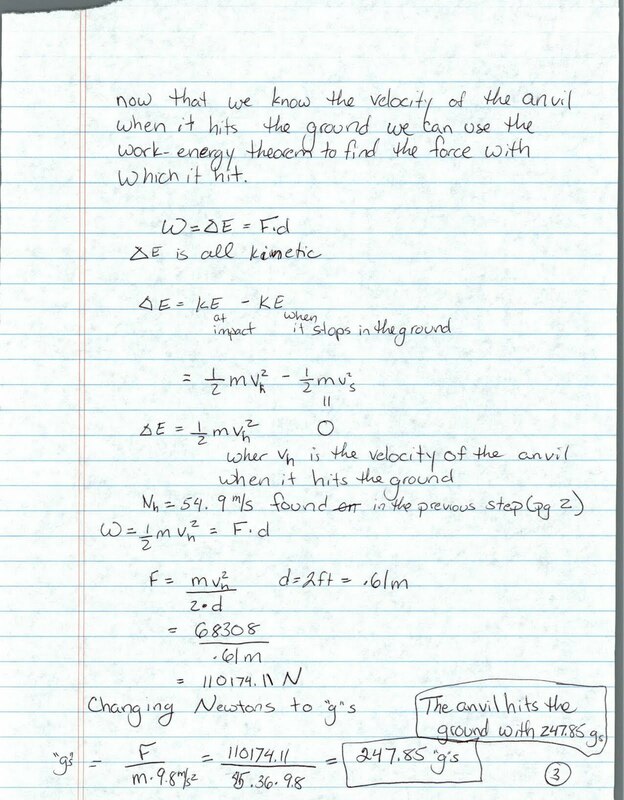 All those anvil shooters know more about center of mass, rotational energy and momentum than many intro physics students. 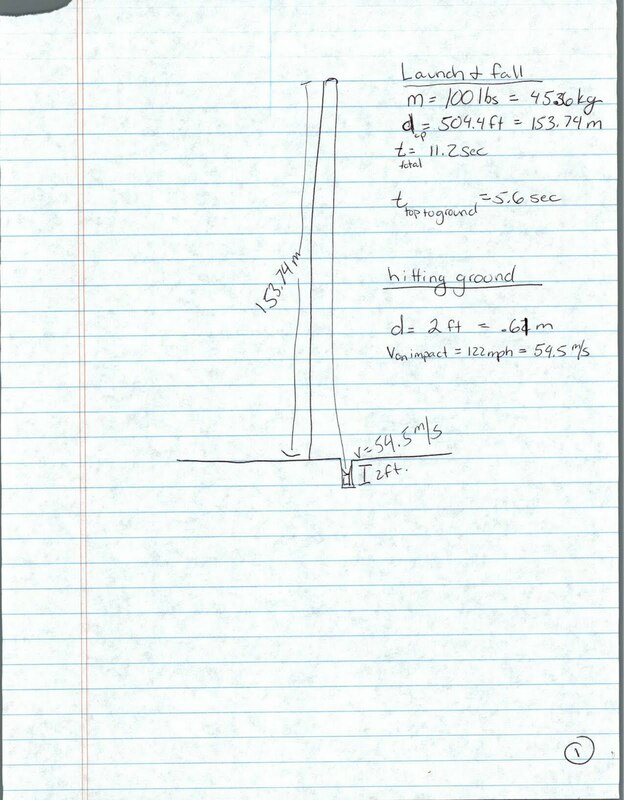 To get the anvil to fly as high as possible, they need to make sure the explosion occurs right under the center of mass of the anvil. If you've seen an anvil, you know that finding the center of mass is no small feat, but these guys (and gals) are masters. If the explosion is a little off, the anvil tumbles while it flies so some of the energy from the explosion goes into making it rotate and less energy can go into making your anvil go higher than the other guy's. If the base anvil isn't completely level, the anvil will launch at an angle and land far from the base, losing the team points. So what did they need me for? Well, to make it all sound really impressive, as if it didn't already. 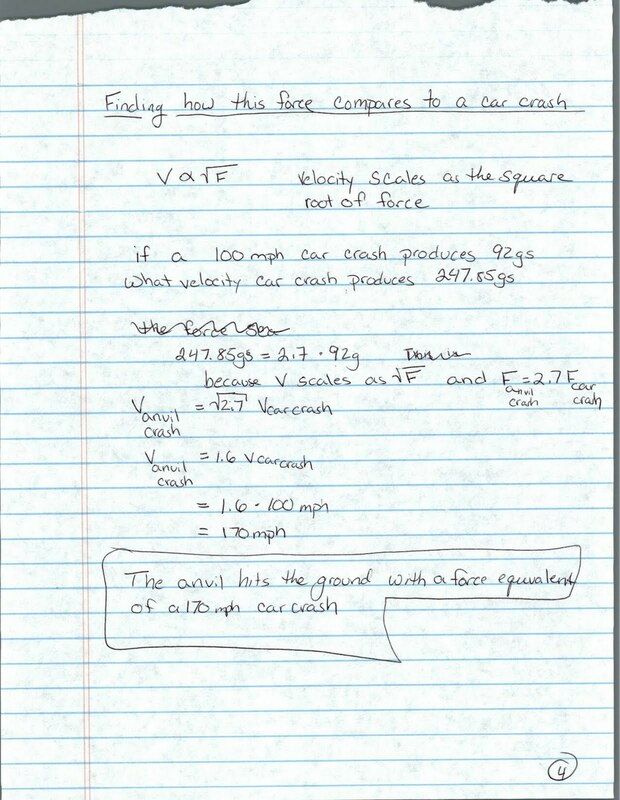 They needed two things from me, an equation saying how to find the height of the anvil if you know its hang-time and a way to relate the anvil force to a car crash. The first was easy, its page 31 of Tipler's "Physics." 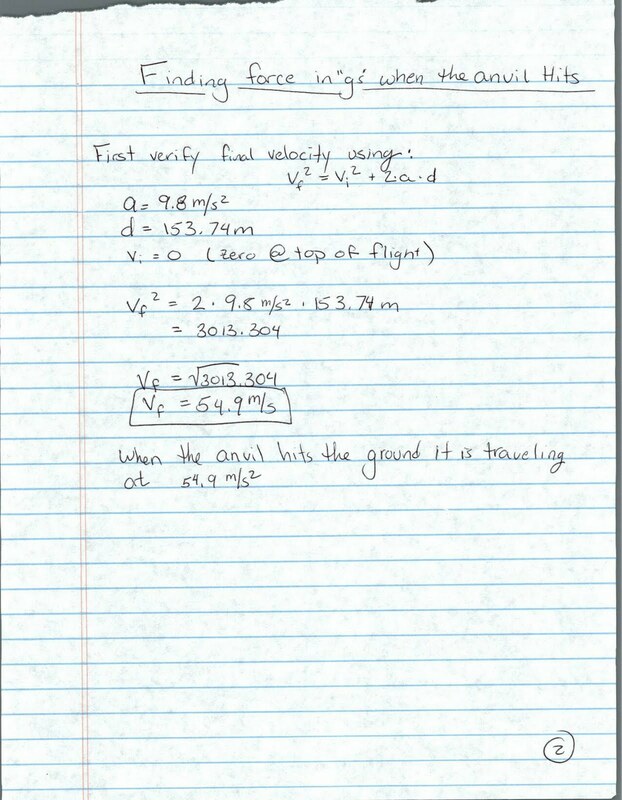 The height the anvil flew is equal to one half of the acceleration of gravity times the square of the time it took to fall. 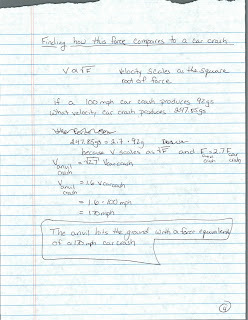 The car crash calculation was not as easy. The producer said, "This is the line we want in the script, fill in the number: 'the anvil hits the ground with the force of a XXXmph car crash.' Assume a 100 mph car crash is 92gs." The anvil shoot in question was not a competition shot, it used a special base and 2lbs of black powder to make an anvil go where no anvil has gone before. In this case that meant 504.4 feet. That is pretty darn high with some serious hang-time. An anvil like that hits with the force of a 170mph car crash. As promised, here is my work. I included all my units and conversions so don't take points off for that. In the second page take a look at the units. You wrote m/s2 and it is m/s. Wow, good eye, Eufisica. I'm glad to see someone paying such close attention. 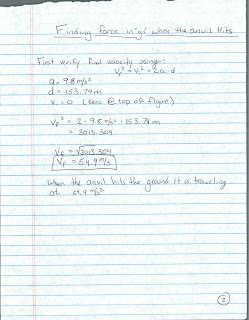 She corrects the units error on page 3. Darn it! -10pts for me! 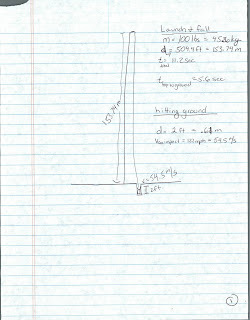 But it is just an error in how I wrote the units, not my calculations and final answer. Thank goodness!